Do you have a sweet tooth? Do you constantly fight sugar cravings? Good news: Even though you follow a low carb diet, you can still enjoy some of your favorite treats. And while these desserts shouldn’t make up the base of your calories by any means, there’s no reason you can’t indulge on special occasions. 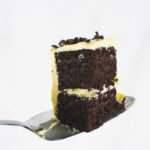 No, that’s not a typo — you’re about to dip your fork in chocolate cake smothered in buttercream, all for a fourth of the net carbs you’d get from a single apple[*]. The secret to this cake recipe is stevia — a zero carb, zero calorie sweetener that’s over 200 times sweeter than regular table sugar. Combined with almond flour, coconut cream and vanilla protein powder, this is a protein-packed, low sugar dessert you don’t need to feel guilty about. You’ll learn about each of these ingredients in depth below. When following a low carb recipe, particularly for a dessert, you will always swap out white or wheat flour for a low carb alternative. Typically, this is coconut flour or almond meal flour. It’s abundant in several key vitamins and minerals, including vitamin E, calcium, potassium, iron, magnesium and manganese[*]. Almond flour is also a suitable swap for those diagnosed with diabetes. The consumption of almonds has been shown to help reduce blood sugar and insulin levels[*]. Most keto baked goods call for a healthy fat, and this cake calls for coconut cream, which can help lower blood pressure, boost your energy and prevent a blood sugar spike. All keto, low carb desserts usually have a zero carb sweetener, such as powdered monk fruit and stevia. This chocolate cake calls for stevia, which you’ll learn about below. Stevia is an extract of the herb Stevia rebaudiana. Native to South America, the stevia plant has been used for around 200 years to sweeten food and beverages. It’s exponentially sweeter than regular white sugar but doesn’t raise blood glucose levels. Since it’s so sweet, you only need trace amounts (rather than the 1–2 cups of sugar most desserts call for) to bake a treat. You can find stevia in many forms — typically drops or powders. Powdered stevia is your best choice. Double-check the ingredients to make sure it’s not combined maltodextrin, dextrose, cane sugar or artificial sweeteners, all of which can raise your blood sugar levels. What Makes It So Sweet? Stevia contains sweet-tasting compounds called steviol glycosides. There are 11 major steviol glycosides, each one up to 250–300 times sweeter than sucrose. A single stevia leaf can contain one steviol glycoside or several, which makes it incredibly sweet[*]. Now that you know the basics of a perfect keto cake, let’s talk frosting. Buttercream is typically made by whipping powdered sugar and butter, but that doesn’t mean you have to kiss it goodbye on keto. Instead of powdered sugar, you can use Vanilla MCT Oil Powder. MCT stands for medium chain triglycerides, a form of saturated fatty acids. Unlike long-chain fatty acids, MCTs don’t need digestive enzymes to be broken down for energy, so they’re not stored as fat and are used as energy instead. Inside your body, MCTs boost blood ketones, so it’s an excellent fat for ketoers. MCTs can be eaten through whole foods such as coconut, or you can get MCTs through supplements. However, in whole foods MCTs are mixed with other long-chain fatty acids, so you get smaller doses and don’t get the quick energy boost. Perfect Keto MCT Oil Powder in Vanilla only contains MCTs extracted from organic coconuts and, in this recipe, it takes the place of vanilla extract for an incredible keto baking hack. For your next celebration, bake this moist, delicious chocolate cake that will keep your carb count low and cravings at bay. Thanks to the limited ingredients, limited carbs and health benefits, this is the perfect cake to make next time you host a birthday, engagement party or another special occasion. Cheers! This delicious keto birthday cake recipe is low carb and jam-packed with all the healthy fats you could imagine! 1/2 pound of Kerry gold butter (1 block), softened. In a large microwave, safe bowl microwave the chopped up chocolate for 30-40 seconds until soft. Whisk until smooth then mix in the coconut cream and whisk until completely smooth. If it thickens too much, microwave it for 10 seconds. Then continue to whisk until glassy and smooth. Once it has cooled, mix the eggs and stevia in until fully combined then set aside. Mix all of the dry ingredients in a separate bowl then fold them into the wet mix. Transfer the batter to a greased loaf pan. Bake for 25-30 minutes. Let the cake cool before unpaning. Cut the loaf in the middle evenly, you’re going to stack them. Whip the butter and Vanilla MCT powder until smooth. Add 2 tablespoons to one square, smooth it out and then stack the two cake squares. Apply one thin coat of butter cream, this is the crumb coat- then set it in the freezer fo the butter to harden, about 20 minutes. Remove from the freezer and finish applying the buttercream with a spatula. Garnish with chocolate chips! Done! How much chocolate does this recipe require please? How much sweetened dark chocolate is required? I can’t seem to see it in the ingredients list. YOu say to microwave the chopped up chocolate but it’s not on the list of ingredients. How much chocolate should I use in this recipe? I think you’re missing an ingredient?? You say to chop up the chocolate and add to the coconut cream but you have powder written down??? “In a large microwave, safe bowl microwave the chopped up chocolate for 30-40 seconds until soft.” How much chocolate? The ingredients do not list the amount of chocolate besides “Chocolate Chips or Cacao nibs” which I assume to be for decorating. Apologies for that. It is 4 ounces Stevia sweetened dark chocolate, chopped. 4 ounces Stevia sweetened dark chocolate, chopped. Where IS the recipe? Nothing I click takes me to it. Hi Leanne, our developers are working on site updates and fixing recipe issues. The recipes should be back tomorrow! Check back in a bit. Thank you! What exactly is the crumb coat? Hi Audrey, the crumb coat is the base coat of icing on a cake.